Tampa Wedding Expo – I Do Bridal Show Join over 40 wedding vendors Sunday, February 22, 2015 from Noon-4 p.m. at the Downtown Sheraton Tampa Riverwalk for the “I Do Bridal Show.” Tampa Bay brides will be greeted with a glass of champagne and have the opportunity to meet with wedding planners, dj’s, photographers, florists and more…. 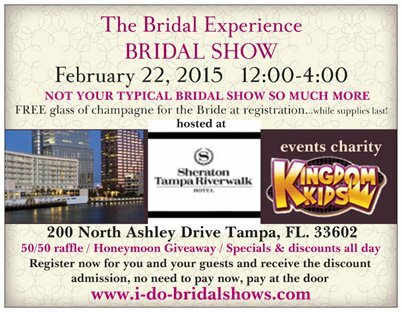 Join us this weekend at the “I Do” Tampa Bridal Show! – Featuring Cousin Anthony “Cake Boss” star!